Alex earned her PhD in Chemical Oceanography at Florida State University. 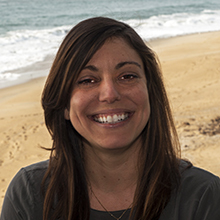 Prior to joining MBARI and CeNCOOS, Alex served most recently as a Program Analyst for the U.S. Integrated Ocean Observing System (IOOS). There, Alex lead the new strategic planning initiative on behalf of the IOOS Committee and other IOOS advisory and regional associations to develop and communicate the shared priorities for the next five years. In addition, Alex served as a National Sea Grant Knauss Marine Policy Fellow for the NOAA Ocean Acidification Program 2016-17.